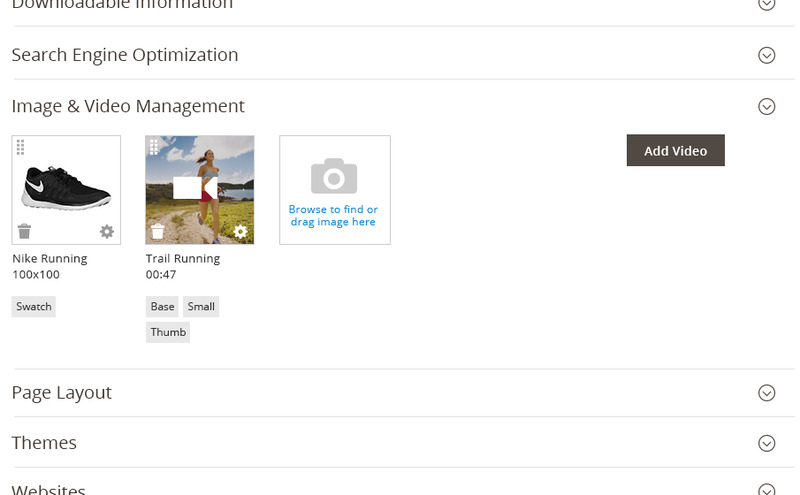 The Image uploader provides the ability for users to upload a single image, or group of images, to the application, most commonly images associated with Products (during the Product Creation process). These images may serve as thumbnail images, detailed Product images, images to within a product gallery, etc. 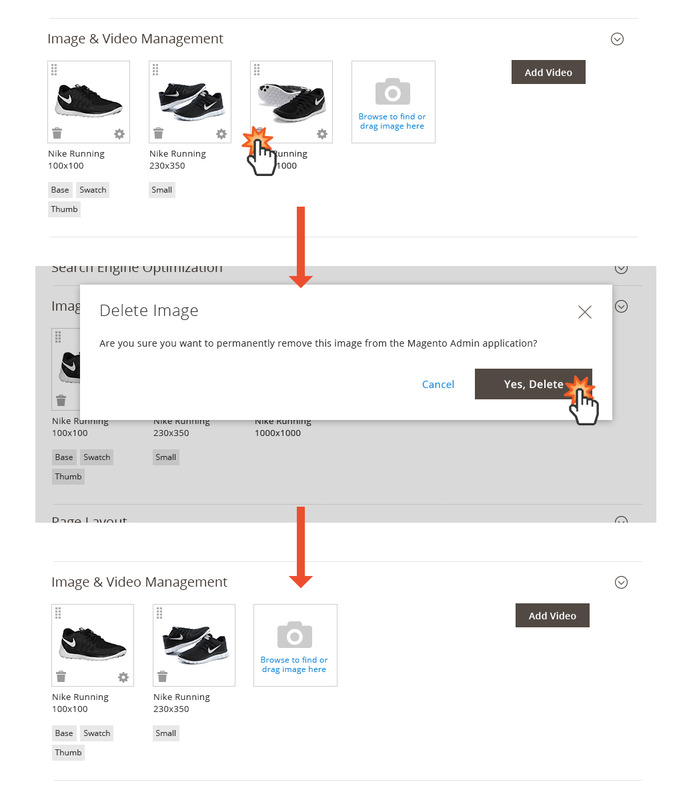 When it is desirable to allow users to upload a single image or multiple images for display within the Magento Admin or on the Storefront . This pattern should be used specifically to upload images, and not to upload documents such as PDFs, WordDocs, Spreadsheets, etc. Please refer to the “File Upload” pattern. 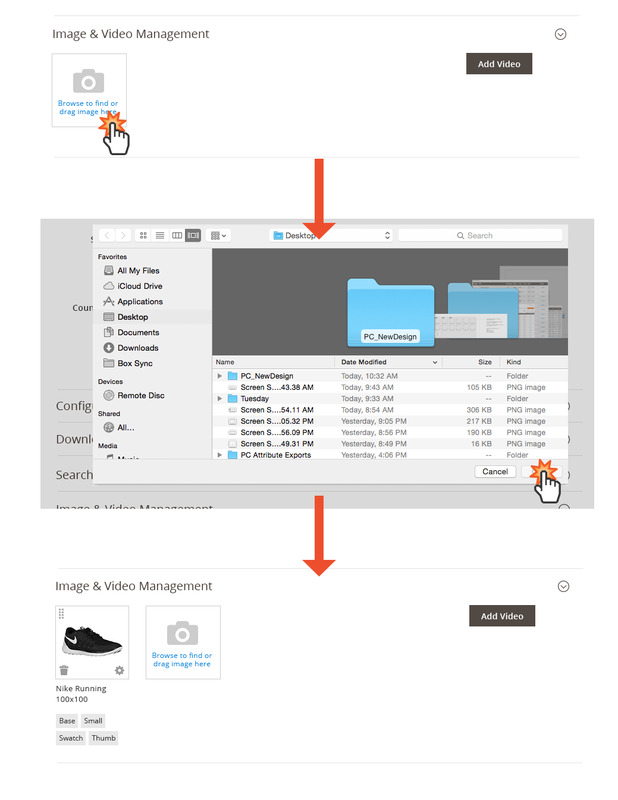 The Image Uploader allows the user to browse for images to upload to the Admin application. This can accommodate single or multiple image upload. To initiate this behavior the user clicking on the “Upload Image” link (target area). The user then proceeds to select the desired images via the browser, using SHIFT + click or ALT/COMMAND + click to select multiple image files. The user may also upload images (single or multiple) by dragging the desired images onto the Image Upload target area. 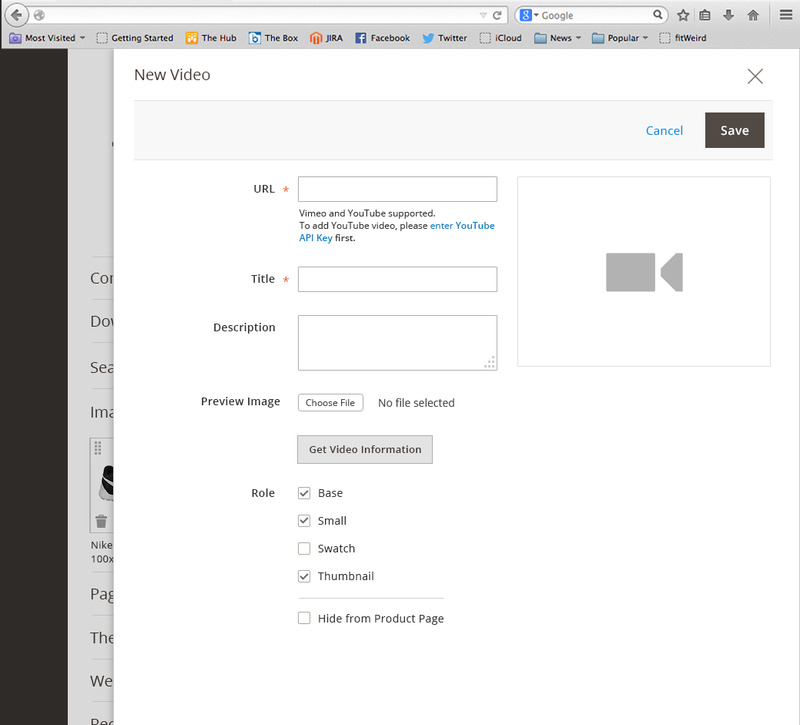 To upload a video to the Magento Admin application the user taps the “Add Video” button. A video settings panel is revealed that allows the user to provide the URL location of the video, write a description and upload a preview image for the video. The user taps the “Save” button to upload the information. Once the video information is saved, the video settings panel closes and the user is returned to the image uploader (section) where the video preview image now appear. 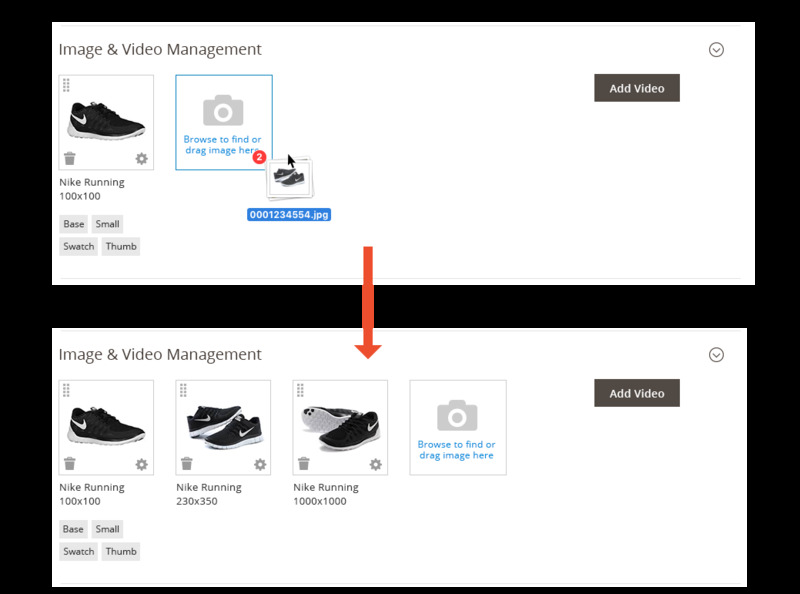 NOTE: Currently Magento 2 does not allow Drag and Drop for Video Content. 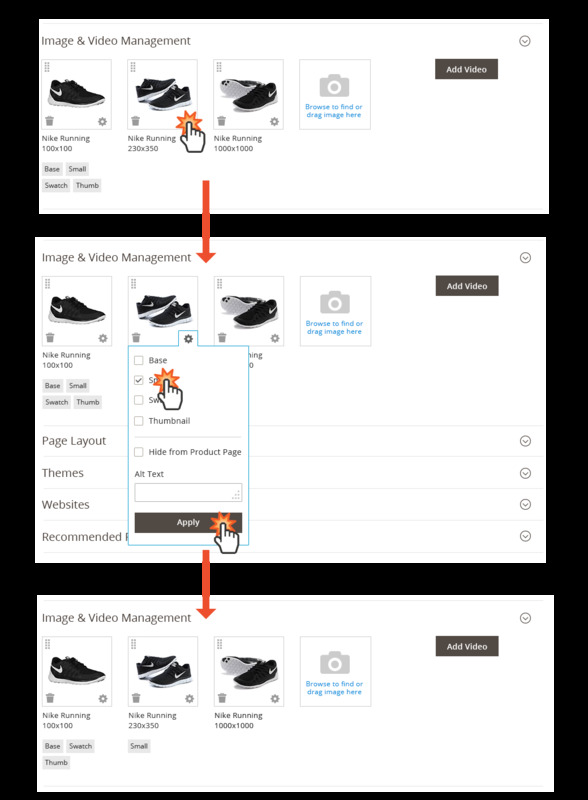 In some areas of the Magento Admin application uploaded images my have additional settings that effect the display of these images on the Storefront (e.g. Product Creation). These settings can be accessed via the “gear” icon found on the image thumbnail. Likewise, an image may be removed from the Magento Admin application by tapping the “trashcan” icon. In the browser upload window, standard behavior should be kept. Download Image Uploader PSD source.